The Pac-12 is in a bad way. This league is as bad as I have ever seen it. Last year was a mess, with just three teams making the NCAA Tournament and two of them playing in the First Four. All three teams lost in their first game, including an Arizona team that had Final Four potential. There isn't much reason for optimism as we enter this year, either. Arizona, which has been the dominant figure in this conference over the past decade, is on the ropes because of its involvement in the FBI's investigation into college basketball recruiting. Oregon is rebuilding. UCLA is still struggling to embrace Steve Alford and has a slew of injury issues. And the rest of the league lost more talent than it gained. It's going to be a long season for basketball on the West Coast. These things go in cycles. For years this league was underrated. And whatever is wrong with it isn't terminal. There is still a ton of talent floating around on the West Coast. It's going to be a long season with plenty of ugly spots. But consider this season a stepping stone to what these programs think will be a brighter future. Last year the Ducks took a predictable step backwards after losing almost all of the talent from the 2017 Final Four squad. But Dana Altman doesn't stay down for long. And after missing the NCAA Tournament last season, he appears to have a team capable of winning the Pac-12. The talent here is pretty raw. Altman brought in one of the best recruiting classes in the country, with five Top 100 recruits and two potential stars in Bol Bol and Louis King. Last year highly-touted freshmen Victor Bailey and Kenny Wooten didn't exactly set the world on fire, but they will try to raise their profile as sophomores. Veteran Payton Pritchard is here to be a steady hand. I'm not as high on this team as some people. The talent is appealing, though I think this group will be a little erratic. I think that the Huskies enter the season as the best team in the Pac-12. They have virtually the entire team back from last year and have four three-year starters in David Crisp, Matisse Thybulle, Noah Dickerson and Sam Timmins. They also have sophomore Jaylen Nowell, who led the team in scoring as a freshman. This is Year 2 in Mike Hopkins' system, including the 2-3 zone he learned at Syracuse, and this team could be ready to make some serious noise. Hopkins has some nice pieces in his freshman class, and I don't think depth or athleticism will be an issue for this group. Steve Alford hasn't exactly endeared himself to the UCLA faithful and has not turned the Bruins back into the powerhouse program that West Coast hoop heads expect. Alford will have to replace his two best players from last year's team, Aaron Holiday and Thomas Welsh. And his ballyhooed freshman class has already been dealt two tough injuries, with Tyger Campbell and Shareef O'Neal both out for the year. Alford still has six other freshmen and sophomores Jaylen Hands and Kris Wilkes to lean on. Experience is in short supply. And I don't really see this team making any noise on the national level. But recruiting experts love freshmen. If they are as good as the hype, UCLA could be a threat in the Pac-12. I felt like USC was one of the biggest disappointments in the country last year. They also lost three of their four double-digit scorers. So it's a bit of a stretch to think that this year's team will be significantly better. Maybe this group will benefit from better chemistry. Overrated forward Bennie Boatwright is back. They need Jonah Mathews, Derryck Thornton, Shaq Aaron and Nick Rakocevic to go from role players to money players. Throw in two Top 60 freshmen, and Andy Enfield will have talent to work with. Getting them to work together and do the little things that winning teams do will determine what the upside is for this group. Things are a mess in Tucson. Sean Miller is smack in the middle of the FBI's recruiting investigation, and he is hanging on to his job by a thread. To make matters worse, this team lost No. 1 overall pick DeAndre Ayton and the team's four other starters. The remnants of this roster is pretty feeble. Miller is a great coach. He'll coax as much as he can out of them. But there's just not anything there to work with. He desperately needs three transfers and two freshmen to pay instant dividends. And even if that happens, this doesn't look anything like an NCAA Tournament team, which is a far cry from the teams that Miller has been fielding the last few years. Utah - Don't sleep on Larry Krystkowiak. This guy has been an outstanding coach, and he excels at getting the most out of unknown players. Sedrick Barefield gives Utah a go-to guy. However, chemistry and cohesion will be in short supply as Krystkowiak tries to integrate 11 freshmen and transfers into his program to go with the four players that averaged more than 15 minutes per game from last year's NIT finalists. Colorado - The Buffs gave a lot of minutes to a lot of freshmen last year. They are hoping to see some of the returns this winter. McKinley Wright is a stud. He'll need some help, though. And the most likely contributors will be center Dallas Walton and senior Namon Wright. Tad Boyle has his system. He's one of the last guys to still use a modified Princeton offense. His guys are going to get shots. They didn't make enough of them, posting the No. 11 shooting team in the league last year. Someone other than Wright needs to become a consistent scoring option if they are going to move up the rankings. Oregon State - This looks like a make-or-break season for Wayne Tinkle. His son, Tres, is one of the best players in the Pac-12. And assistant coach Steve Thompson's son, Stephen, is also outstanding. Thompson is a senior and Tinkle is a junior, and time is running out for these two to help the Beavers break through. Tinkle took Oregon State to the NCAA Tournament in his second season. He's now in Year 5, though, and he desperately needs someone - anyone - to step up to help out his two studs. I don't know where that support is going to come from, and the best-case scenario for this group looks like the NIT. Arizona State - Last year the Sun Devils had an abundance of good guard play and no post presence. This year they have plenty of post presence but few reliable guards. ASU lost its three best players from last year's NCAA Tournament team. This year their strength will be on the inside with Romello White, De'Wuon Lake, SDSU transfer Zylan Cheatham and freshman Taeshon Cherry. The backcourt is really unsettled. Remy Martin showed signs as a freshman last year. This year's top recruit, Luguentz Dort, will have typical rookie ups and downs. Cleveland State transfer Rob Edwards needs to be good right away. Bobby Hurley is going to earn his paycheck this season. Stanford - Losing transfer Reid Travis was a gut punch to the Cardinal and severely alters their expectations this season. Sophomore's Daejon Davis and K.Z. Okpala look like the real deal, and classmates Oscar da Silva and Isaac White showed some flashes. But that's it. The rest of this team is trash, and they have only two guys on the roster that have averaged more than seven points per game at the college level. 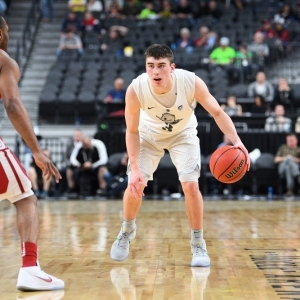 Haase will continue to develop his first recruiting class and the hope is that this season serves as a bridge to a positive 2019-20. Washington State - I actually thought that Ernie Kent would be able to stabilize this Washington State program when he came on board four years ago. But rather than a recruit-and-develop approach, Kent has opted for a bunch of quick fixes through junior college transfers. It hasn't worked. This year Kent will lean on high-scoring Robert Franks and not much else. This team will remain a total non-entity in the league, and I wouldn't be surprised to see Kent get the axe after the season. California - Wyking Jones went 8-24 last year, and I don't see the Golden Bears being any better this season. Jones has a four-man freshman class, and he'll hope that some of his sophomores can continue to improve. Jones is trying to build from the ground up, and he'll need some patience.